The Department of Health and Senior Services (DHSS) Division of Community and Public Health is responsible for conducting the Pregnancy-Associated Mortality Review (PAMR) program to improve surveillance and analysis of maternal deaths in Missouri. 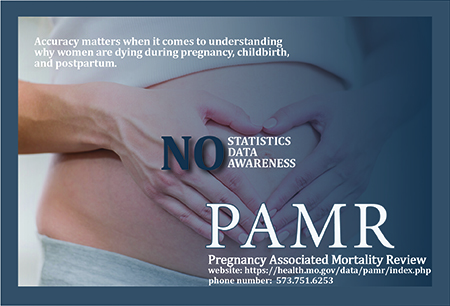 The PAMR Committee analyzes all maternal deaths that occur while a woman is pregnant, or within one year of the end of her pregnancy. This requires an in-depth medical and social review to look into the factors that contribute to, or directly cause the death, and to prevent future occurrences. The PAMR Committee consists of approximately 18 geographically diverse members representing various specialties that interact and impact maternal health. The death of a woman while pregnant or within 42 days of termination of pregnancy. The death of a woman during pregnancy or within one year of the end of pregnancy from a cause that is not related to pregnancy. The death of a woman during pregnancy or within one year of the end of pregnancy from a pregnancy complication, a chain of events initiated by pregnancy, or the aggravation of an unrelated condition by the physiologic effects of the pregnancy. 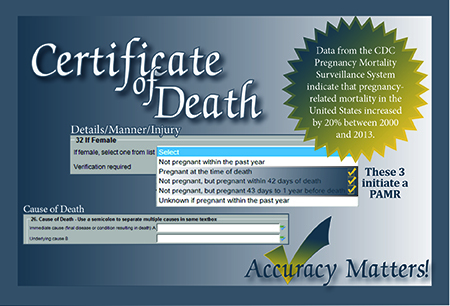 Through the utilization of a broader definition, as well as the increased sources of linked data, the PAMR program is able to identify more accurately the pregnancy-related deaths in Missouri. Upon establishing a maternal mortality review committee in 2011, the Missouri PAMR program completed a historical analysis of maternal deaths from 1999 through 2008. By 2013, the program had not yet engaged community stakeholders, and decided to use its findings as an opportunity to raise awareness of maternal mortality in the state. The DHSS conducted three town hall meetings with health providers and the public to share its findings from reviewing more than a decade of maternal deaths. In addition to raising awareness of the problem of maternal mortality, the committee wanted to solicit community perspectives on the major barriers to care for pregnant women so that it could develop targeted interventions. The community’s feedback was consistent with the committee’s findings: limited access to care, unhealthy lifestyles, prevalence of chronic conditions, substance use, poor health literacy, and inadequate provider knowledge of contributors to maternal mortality. Ensure the efforts of their reviews characterize the factors contributing to maternal deaths lead to data-informed and effective population-based strategies to prevent further occurrence. Assess awareness of maternal mortality issues. Assess barriers to preconception, prenatal, and postpartum care. Gain insight to potential prevention strategies. Expanded Missouri Hospital Association (MHA) initiatives (preeclampsia and hemorrhage toolkits) to birthing hospitals in Missouri. Implemented a marketing campaign that targeted women of childbearing age to increase their awareness of maternal mortality and morbidity risks.